Listening to DJ Paulo Lopes playing is a unique experience. He is the only DJ in the dance music culture that is blind. And similarly to seminal artists deprived for the visual sense – like Shi Kuang, Stevie Wonder, Ray Charles, Blind Lemon Jefferson, Sony Terry or Blind Willie Johnson – he takes the whole music audition to another level. Paulo was born in Portugal and at an early age – 6 years old – he emigrated to France. He lost his vision in the same year due to a genetic cause. Despite being blind, in France he developed his own passion for living: he studied classical piano till his 15 years old; he graduated in both Economy and History at Paris VII University; he went into punk, gothic rock, experimental and industrial music as a fan and as event organizer during the 80s. The end of the 80s caught him up in the advent of electronic dance music and the emergent raves, teknivals and parties in France and Northern Europe soon hooked him. His musical taste for music went from Detroit and acid house, EBM, new beat and by the beginning of the 90s he was at the beginning of the goa trance through the parties in Paris. Paulo began to be involved with party organization and he was one of the early enthusiasts of the goa trance scene in Paris, at the time one of the most important scenes in the whole world. In 1996 his musical background and skills were important to another step: he started to DJ. The singular awareness of sounds and his stunning perception due to his blindness made him a must-listen DJ. 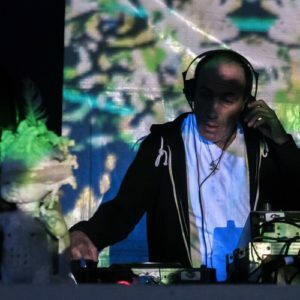 Always different and psychedelic, ever evolving in searching for new sound dimensions and expanding the boundaries of the psychedelic music, Paulo Lopes is still today an outstanding figure in the psy-trance scene. Nowadays Paulo is based in three places: Trancoso (Brazil – since 1996), Paris and Portugal. In Brazil he has been striving for the underground psy-trance scene for years. He organized parties from 1996 to 2000 in Bahia. He played in cities such as São Paulo, Rio de Janeiro, Belo Horizonte, Salvador to name just a few and in festivals like Universo Paralello, Megavonts, Orion, Trancendence. In 2004 he released the mix-CD “Inner Visions” for Quantika label. In Portugal he has been one of the pioneers of the psy-trance scene with gigs in the historical Boom Festival (1997, 2000, 2004), after-Boom Utopia, Sinergia, and for organizations such as Quest 4 Goa or Hipnose. Nowadays Paulo Lopes is still playing with an incredible passion for living: a blind person that uses music to express the magic of life and the hidden dimensions of sound. Listen to him, one can understand the true definition of psychedelia as Dr Humphrey Osmond once coined it: “mind manifesting”.